Put your Toy Story mini-figures into movie action! These exciting playsets are based on favorite scenes. Each set includes 2 exclusive figures! Connectable to other mini-sets and compatible with all Mattel mini-vehicles. Put your Disney-Pixar Toy Story mini-figures into movie action with these exciting playsets! Based on favorite scenes, each set includes 2 exclusive figures to start the fun right away. They're also perfect for display, collection, pushing, and racing action! And the excitement doesn't end there. 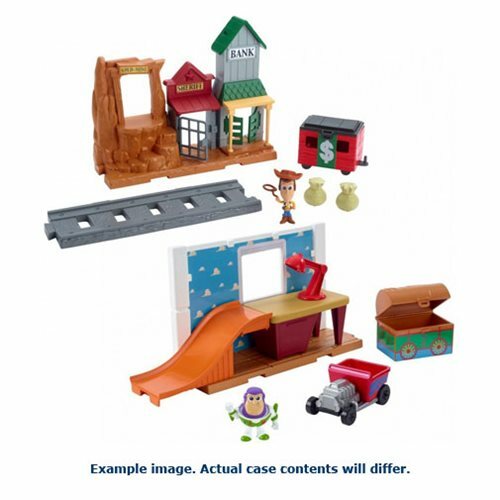 Each set is modular, connectable to other mini-sets, and compatible with all Mattel mini-vehicles so fans can continue the Toy Story play in a big way! Other figures, sets, and vehicles sold separately.